This is a great, important day. Goddess of etiquette, assist me while I describe it. 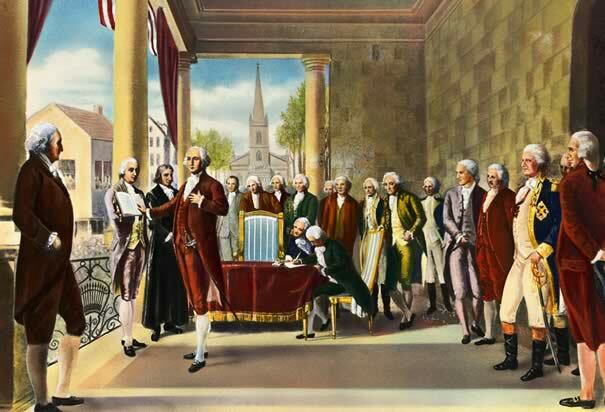 The President [George Washington] advanced between the Senate and Representatives bowing to each. . . . The Vice-President [ John Adams] rose and addressed a short sentence to him. The im- port of it was that he should now take the oath of office as President. He seemed to have forgot half what he was to say, for he made a dead pause and stood for some time, to appearance, in a vacant mood. He finished with a formal bow, and the President was con- ducted out of the middle window into the gallery, and the oath was administered by the Chancellor. As the company returned into the Senate chamber, the President took the chair and the Senators and Representatives their seats. He rose, and all arose also, and addressed them. . . . This great man was agitated and embarrassed more than ever he was by the leveled cannon or pointed musket. He trembled, and several times could scarce make out to read, though it must be supposed he had often read it before. He put part of the fingers of his left hand into the side of what I think the tailors call the fall of the breeches, chang- ing the paper into his [right] hand. After some time he then did the same with some of the fingers of his right hand. When he came to the words all the world, he made a flourish with his right hand, which left rather an ungainly impression. I sincerely, for my part, wished all set ceremony in the hands of the dancing-masters, and that this first of men had read off his address in the plainest manner, without ever taking his eyes from the paper, for I felt hurt that he was not first in everything. Maria Lydig was a tough cookie. In 1856 she defied her patrician family to marry Charles Patrick Daly, a son of poor Irish immigrants. He was also one of New York’s most respected judges and social reformers. As she matured, Maria Lydig Daly spoke her mind freely and forcefully, often leaving a verbal adversary in ruins. I deduce this, not from any existing audio recording, but from reading her no-nonsense entries published as Diary of a Union Lady: 1861-1865. 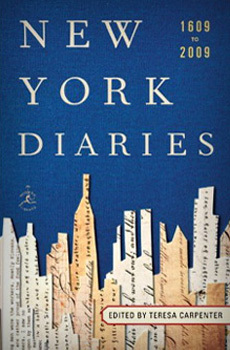 She exemplified the ambivalence that New Yorkers felt toward the Civil War. A Union Democrat, she and The Judge, as she invariably called him, remained loyal to the North even as the “copperheads”, northern Democrats such as Mayor Fernando Wood, (catch his consummately evil star-turn as a congressman in Spielberg’s Lincoln), were lobbying to drag the city into the Confederacy. Their motive; preserving ties to Big Cotton. Maria’s reservations were more specifically articulated: She detested abolitionists almost as much as she despised secessionists, especially the women, dismissing them as rabble-rousing opportunists. To wit, her entry of June 11, 1862. Dined yesterday at Dr. Ward’s and took a drive in the afternoon in the Central Park. If one lived there, no country would be more desirable – one would have all the luxury of a country seat without the trouble or expense. A niece of Dr. Ward, a Virginia lady, is staying there and is a violent secessionist. It is a pity that the abolition female saints and the Charleston female patriots could not meet in [sic] fair fight and mutually annihilate each other…. Nor did she have kind words for Abraham Lincoln. On September 11, 1862, after Lee’s army had crossed the Potomac threatening the capital, she wrote. Baron Gerolt tells us that fifteen hundred men were laying for five days, still alive, on the battlefield, and that thousands died from mere starvation. The wretched heads of departments know nothing of their duties, and the honest fool at their head is content playing President.… I am sure I would not willingly sit at the table of Lincoln or his wife, much less receive them at mine. 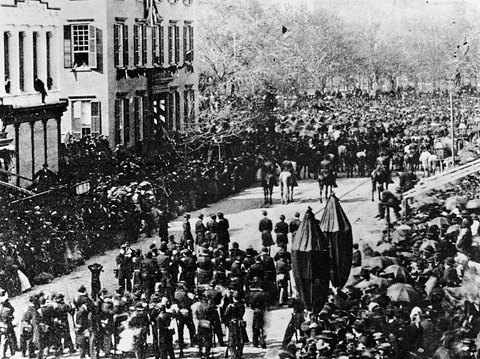 Today President Lincoln’s funeral procession passed through the city. The body lies in state in City Hall and some three hundred thousand people, they say, have visited it…. Both yesterday and today all business has been suspended and I read that the 25th of May is to be another fast day. Poor Mrs. Lincoln! Circumstances verily make the man. A house opposite to us, having not been put in mourning, was tarred. Tomorrow the theaters reopen and then, I suppose, all will be over. 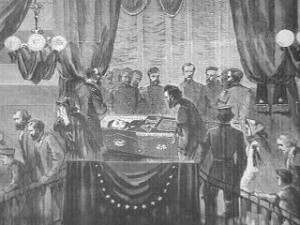 The sketch above depicts New Yorkers filing past Lincoln’s casket at City Hall. The Photo below shows his funeral procession heading north on Broadway toward Union Square. One of the two children in window at top left is commonly believed to be Theodore Roosevelt.